A time-tested set of rules for running “deliberative bodies”, such as committees, corporate boards, and legislatures. A “deliberative body” is not defined in the Rules (as far as I can tell), but reference is made to “the fundamental right of a deliberative assembly to have questions thoroughly discussed before it is called upon to take action upon them, unless a large majority, at least two-thirds, is prepared to act at once”. The rules specify a set of motions, and specify what these motions mean and what happens when they conflict. Many of the motions deal with setting the agenda. There are also motions to deal with “meta-issues” such as adjourning a meeting, changing the rules for debate, etc. Most of the structure deals with temporally linearizing issues, that is, dealing with the constraint that only one person may speak at one time. However, it is possible that some of the structure could be adapted for the purpose of asynchronous online deliberation. I’ve never been in a committee which used these rules, but it seems to me that an adaptation of them would be quite useful online as a way to set a common agenda, and to make sure that decisions made by an online community were made with the knowledge and input of all community members (even if not everyone agreed with the final decision). Separately, I expect that a program which administered the rules would be helpful in face-to-face meetings (by eliminating the need for a chairperson to administer the mechanics of the rules by hand). There seems to exist one free software product, Roberts Rules Assembly, but I don’t know if it’s open source (I think not). And it seems to implement a simplified version of RR, but I can’t really tell yet without emailing and asking for a copy. There’s a commercial program which sounds neat (about $44). There’s some academic who seems to be interested in building such a system. But I didn’t list them because they’re not open source. Useful if we want to build such a system: Henry Prakken has formalized Robert's Rules into first order logic! This is what we’d need to enter as (configuration?) data anyway, so it’s nice that someone has already extracted the logic from the English description of Robert’s Rules. I tried to extract the logic from Prakken’s paper with pstotext and perl, but too much of the symbol information is lost (i.e. “there exists” and “not”, etc). A Google search turns up a few hits for a “ps2tex”, but I can’t find it. I sent an email to Dr. Prakken letting him know that I might be making a Robert’s Rules helper, and asking if he’d be willing to contribute either a database, or the latex source for his report (from which the rules could be extracted). I’ve been on a number of working groups that have used Robert’s Rules, and used them successfully. But in most cases what I’ve/we’ve found is that the Rules are too formal for “normal” activities, so what we’ve done is allow completely free activity until such time as any member invoked the Rules (by simply stating that they were doing so) in order to formalize the situation due to some problem. IOW, we avoided the Rules until we needed them. But I can attest to them working very well at fairly creating a situation where arbitration can occur, and occur in a way that is workable for all parties. I agree with Murray. In fact, I possibly feel stronger: I feel there’s a good place for something as strict as Robert’s Rules, but I’m not sure that it’s online. I believe much stronger that things like OpenSpace better model what we do here in the online world. Online, the major limitations on space are the ones we’ve made in our UserInterface. Easily amendable. I’ve heard of lectures where in addition to the channel of the lecturer’s voice, there’s an IRC chat layer as well. There is some sort of channel for questions, and the teacher can periodicly eye the list of questions to see what people are wondering about. Also: In IRC, people come, people go. We have to account for it in our system. This procedure is for when at least some people are in a hurry. Upon meeting, people gather, and say what’s on their minds. Somehow, an item is picked to be first. When it feels done (people start going into tangents), it’s over. Ask if there’s anything to add or drop from the table. I feel if there’s somewhere we really want to investigate for our IRC meetings, I’d say OpenSpace…! We don’t have to linearize our meetings. I believe that if we integrate OpenSpace process ideas with IRC UserInterface, that we can make something ultra effective. And if we combine it with IrcWhiteboard? or WikiWhiteboard? or whatever we were calling it, we could get a lot of “product” out of it- interesting papers, action lists, etc., etc.,. Multiple chat panels, that can be split or unified with ease. Some sort of discussion coordination space. IrcWhiteboard?, with the ability to save the contents and meta-information (name of the channel, time when the channel session took place, name of the “super-session”- if it has borders-) to a wiki or whatever DocumentServer? system you use for this kind of thing. Ability to see the list of discussions taking place, and a paragraph charter line. The really cool thing about this, is almost all of the pieces are in place to do this, technology-wise..! The only thing we really need also is our SubEthaEdit replacement, and that’s very simple to make. The work here is almost entirely in the domain of UserInterface design. If you say, “But how is this different than IRC + White boards?”- you’re already half-way there. It isn’t! …from a technology perspective. But from a UI perspective, it’s very different. It’s a UI made for a particular use. Good ideas with the IRC stuff. May I move it to IntComm?? Btw, I feel that IRC itself is fundamentally badly designed. Not bad for when it was designed, but bad for today. The system is set up so that you can’t make a simple client which just doesn’t show you all the confusing text (as far as I can tell, that is). I think the newer test messaging systems’ UIs, like Gaim, are superior to IRC. And I guess Jabber is the protocol to match. I agree that RobertsRules are overkill for most situations, and even more so online. I’ve never used them, but I get the impression they are best if you have either a) a large number of people, or b) conflicts of interest, and a strong need to organize the meetings in a fair and impartial way. Also, I think RobertsRules are mainly for meetings in which the participants are making decisions as a group. If a group is just talking about ideas, it may not need this level of structure, whereas the same group of people may need a more formal structure when it is proposing and voting on binding resolutions. Right now I’m thinking of making a RobertsRules helper for offline meetings, for example, the UCSD Graduate Students Association meetings. Online, however, I think a slightly parallelized version of RobertsRules would be helpful for large communities. I was briefly involved with AnewGo, an effort to form an online government on a wiki, and one problem I thought I saw was a lack of a formal legistlative agenda; people would make proposals, and they would be discussed, and voted on by those who saw them, but it was always unclear if those who hadn’t voted didn’t care, or if they hadn’t seen the item (and if not, were they still involved with AnewGo enough that we needed to run it by them, or were they on their way out?). So, I think we needed a list of “current open proposals”; open for discussion, and then open for voting, etc, so that everyone knew what was going on, and so that at the end of those periods, we could be confident that successful proposals had actually been viewed by anyone who would have wanted to object. It could be expected of all members that they would take a look at everything on the list. But, in a large community, there would be too many “proposals” to reasonably require everyone to look at. So there needs to be a way for the community to allow some proposals to be put “on the table” for discussion, for some of those to make it to a vote, and to reject everything else without wasting much time. And there were other issues; some of us signed a charter at the beginning, but then we wanted to amend the charter. Did we have a right had we to amend the charter without universal consent? Could we change a wiki page if the previous content had already been “signed” by some people? RobertsRules addresses all of these kinds of things, and it does so in a way that would “scale” to a large community with opposing factions. So that’s the kind of place I would expect it would be most useful (as a SharedAwarenessSystem). I agree that in most venues, it’s too complex. There is a proof that certain conditions obtained in order to make the decision (i.e. a quorum was present and more than some percent of people voted in favor). In contrast to wikis, where it is often uncertain why (or even if) a decision was made and whether everyone actually supported it. ::For example, under AnewGo’s ConsensusByDefault?, anyone, at any time, could issue a declaration in the name of the community, and that declaration would be valid until another member opposed it. So, if you were an outsider and you read that AnewGo had issued such-and-such a declaration, what would you think? You wouldn’t assume that that declaration really had the strong support and force of the community; you would probably assume instead that a handful of people wrote the declaration and that no one had disagreed before you heard about it. By making it easy to pass a declaration without the true support of the community, the idea of a “declaration in the name of AnewGo” becomes devalued, and there is no quick way for an outsider to tell which of AnewGo’s declarations are serious and which are not. There are mechanisms for throttling the number of proposals under consideration so that the community can insure that most members will actually have time to consider all of the big decisions. In contrast to most forms of online fora, in which the number of proposals on the table can easily spiral out of control. There is a pre-agreed-upon answer to those little procedural disagreements which inevitably spring up. OK, Dr. Prakken gave me the LaTeX source file for his formalization of Robert’s Rules!!! He says its okay to use on the condition that we cite him in any publications. Anyone who wants it, email me. I think the next thing to do is build a Perl script or something which extracts the FOL from the LaTeX document. Then, we’ll know what sort of data we need to deal with, which will inform our data structures. Next, we can write the core logic which tracks the state of the meeting and tells you stuff about the current state. So far, everything we’ve done can be applied to either the offline helper application, or the online community idea. 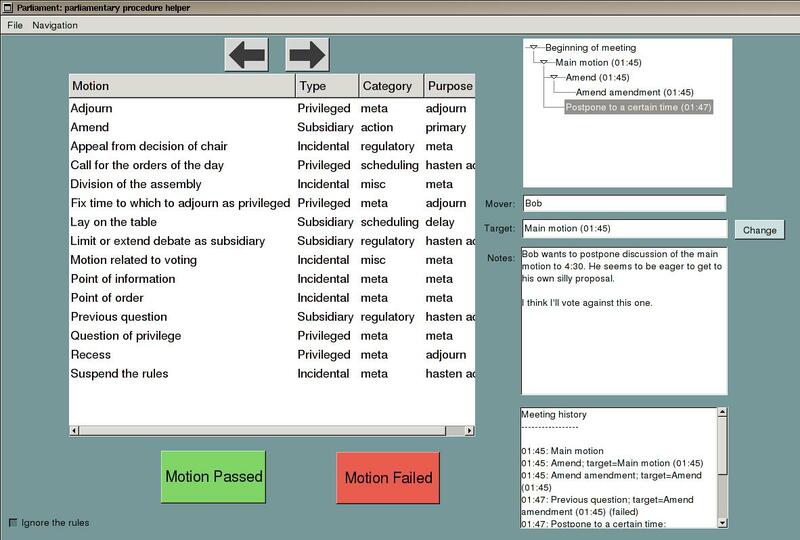 Finally, we could write a GUI for the offline helper application, which would allow a user to sit in a meeting with a laptop, tell the helper what’s going on, and have the helper display helpful summaries of what the legal motions are at this time, etc. I’ve written a preliminary version of the “core logic” described in the previous post, and I parsed Prakken’s stuff into a config file for that application. For example, right now the code can tell you that the motion “postpone indefinitely” can be made on a principal motion, but not on an incidental motion. No UI or docs at all though. Will post again when more progress. The project is at SourceForge at http://parliament.sourceforge.net. IGNORE ROBERT’S RULES - Most union bylaws say that meetings will be run according to Robert’s Rules of Order Revised. The power of tradition is strong: this procedure is almost never questioned even though so many people find it intimidating and so few understand it. Ideally, unions that want to be democratic should start by discarding Robert’s Rules, because Robert’s is not democratic. It was designed for bodies, like legistaures, made up of professional meeting-goers. It is certainly not designed to encourage participation from people who have come to their first union meeting. For example, under Robert’s every discussion must start with a motion, rather than starting with a problem and then, through discussion and cooperation, coming up with a plan of action. Robert’s is so complicated that it violates the most important democratic reason for having rules; to level the playing field by ensuring that everyone can know how to participate. Robert’s is used frequently in the opposite way: to intimidate members, make them feel foolish, and rule them out of order. In addition, Robert’s is designed with a bias toward the status quo. The requirements for a two-thirds majority to pass certain motions, like changing the agenda or moving to vote, don’t just add to the complications. They also make it relatively easy for a minority to block or delay decisions and action. In general the best policy is to do openly what almost everybody does in practice: simply ignore Robert’s Rules, do what tradition calls for in your union, and mix it with common sense and fairness. Most people dislike procedural wrangles and are very supportive of proposals made to handle things in a fair, common-sense way.